After a long wait for Motorola to reveal a successor to their Honeycomb-running XOOM tablet, today the company officially announced not one, but two XOOM tablets - the XOOM 2 and XOOM 2 Media Edition. 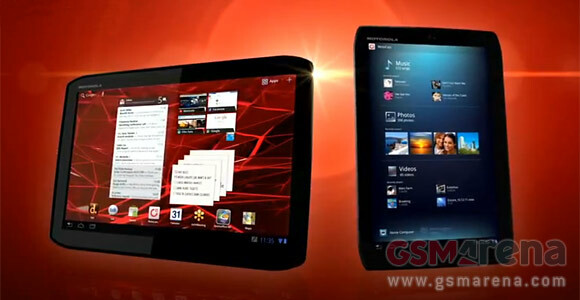 Both tablets boast slimmer and lighter bodies and design features, which seem to be taken straight out the RAZR and initially will be available in Wi-Fi variants only. The XOOM 2 is the direct successor of the original XOOM, packing a 10.1-inch 1280x800 display with Corning Gorilla Glass for extra protection. Powered by a 1.2GHz dual-core processor, the XOOM 2 comes with 1GB of RAM and 16GB of built-in storage, which is yet unknown if could be expanded via a microSD card. Motorola has really tried hard to improve the XOOM 2 and as a result it weighs the whopping 131 grams less than the old XOOM and is thinner by a nudge over 4mm. The XOOM also comes with splash-guard technology, like the RAZR, which features a special coating to prevent incidental splashes from ruining the device. However, in the camera department things are not so rosy. Motorola has thrown the same 5MP camera from the original XOOM, but to make things worse, the XOOM 2 has only a single LED flash, instead of two. The front camera, too,has been downgraded from 2MP to 1.3MP. Still, the battery promises 10+ hours of Web usage and over a month of stand-by time. With its 8.2-inch 1280x800 display, again coated with Corning Gorilla Glass, the XOOM 2 Media Edition fills the company's blank space in the sub 8.9-inch tablet market quite well. Just like its bigger brother the XOOM 2, the Media Edition packs a 1.2GHz dual-core processor, 1GB of RAM, 16GB of storage and 5MP camera at the back. However, unlike it, the XOOM 2 Media Edition weighs in at 386 grams and is a hair under 9mm thin. Naturally, the battery is smaller, due to the size of the tablet, and is good for 6 hours of web browsing and about half a week of music playback, Motorola claims. Both tablets will run Android Honeycomb 3.2, with the company keeping its cards close to the chest whether Ice Cream Sandwich will hit both versions of the XOOM 2. Expect the XOOM 2 and XOOM 2 Media Edition to hit UK and Ireland in mid-November, with more markets to follow soon after. Price is yet unknown, though. And, finally, check out the cool advertisement Motorola has created for the XOOM 2 and XOOM 2 Media Edition.